There is a hated person on the popular anime,「Girl & Shuya」. The Denning, House of the Duke’s third son, or also known as the Piggy Duke, Slow Denning. As a person hated throughout the school, he had a lot of reason to be hated, things like he looks down on people, he brags about his pedigree, fat, real orc, and the Piggy has a tragic future waiting for him, he would be banned from his country at the end. And he even has the misfortune on the side that the retainer that he secretly gives his heart to, was stolen away from him. Wondering why I’m talking about this? It’s because I reincarnated to that Piggy Duke! I will definitely make the Piggy Duke who had the number one position on the anime’s popular poll, also the number one in the real world! I remember reading this a some time ago and had the initial impression that it was good but didn't have much of a strong impression (updates and pacing easily make it forgetful). Though I say that I always found reading this being somewhat good and somewhat reaaaallllyyy annoying because of how the author paces. - It has a good character depth and development. The heroine (s) and other characters get some nice development because of how the author gives us a in depth view on their past and their perspective in the things going around them and what they themselves think about it. We also see their whole growth and change as they struggle and develop through events that occur to them or around them. Don't remember if this applied to the buta mf MC though. * Author is a troll at love developments, albeit the actual developments themselves are stagnant/ignored by recipient for 'reasons' which are actually reasonable. But anyways the author actually trolled me at the Alicia event where she we get her view of her love, I wont spoil for it since it's actually really witty. * The plot is.... well uh simple. Basically about some guy (MC) who gets memories of his past life, knows the future events of his world, changes his future from being a villain into stealing the anime MC's whole harem, romcom, some misunderstandings, being op, and the anime plot where the world needs to be saved from demon king/war. That's it. This in turn keeps the story is interesting because it has a simple objective and the story doesn't fork off into random areas. Everything that has happened, so far, correlates to the anime-storyline/plot. The dialogues with (some) characters along the way also keep it interesting as a slapstick. Never read too deep into this novel, always think to the simplest things. Complex things? Whats that? Is the gist of this novel from where I left off. Its either un/explained horribly, or horribly executed if its anything complex. * Multiple perspectives. We get perspectives of different characters and see how things develop. It isn't just to make the MC look good either, some of them have actual important pieces of information that play a part in the story. Well this realigns with why the characters develop. * MC's whole existence as well as his reasoning in love is shallow. Both are in the: "It's a it's like that because it's like that" reasoning. * The number one most bad thing about this novel, which you can even read from JP reviews, is the god awful random pacing. The author is really bad at foreshadowing and pacing chapters. For each event/volume, the author does a little thing where he shows you things that will happen in the future. This might have been a great way to give the readers a teaser, but holy ---- this author coupled with his pacing+update intervals does it so horribly. Instead of getting a teaser I just end up feeling like reading the ending of the volume (that's more complicated/intricate than the actual result) with no idea how tf I got here. I'm just left confused while the author is over there looking at me with a smug face that's saying "Hah. I see you're left in awe from reading my masterpiece." Which is actually what my impression is because this is a common mistake new writers make: leaving something that should've been so simple into something more complex so that they themselves feel they did something great. * BUHI BUHI. This might have been funny the early episodes, but after a while it serves no purpose other than being a trademark of the MC. Even the whole explanation on why he keeps panting buhi buhi but the whole execution and after-interactions when it's revealed just make it a "Its there because its there"
- Interesting main character background: I like transmigrations into hated main characters and their struggle to change. - Beautiful character design in the illustrations. Even the supposed horrible "piggy duke" is kinda cute. - Translation is average (sticks too much to the original language, untranslated bits here and there, some weird sentences...). I've seen way worse though, so it's a pass I guess. - No logical explanations on the MC goal, he does what he does just because. - The MC is way too emotionally driven, it's like the... more>> fact that he was a transported person is completely forgotten. And it's weird even from the original piggy MC, who is supposed to hide that he's actually smart. - The comical effect of the "buhi" interjection becomes quickly annoying: we get it, the MC is fat. It's the same with the "I'm hated because I'm fat" overuse too. In fact the comedy kinda kills the whole story for me. Could have been a good story if it has focused direction, this series tend to move into random direction. Sometimes it feels like there are lots of logic leaps, like from A suddenly becomes K and then suddenly becomes C. Most of the time there's no logical reason for it, "it just happened to be like that, just ignore it. You lose if you mind." I know this is comedic in nature but the leaps feels jarring even for comedic standard. 'Piggy Duke' (Buta Kōshaku ni Tensei sh*takara, Kondo wa Kimi ni Suki to Iitai) could be a good story, but it's plagued by bad first-person point-of-view sentences. These sentences probably sound better in the native language, but translations are meant to convey the meaning of another language rather than translate word for word. If the translation can't do that well, then it turns away potential readers. In addition, the chapters don't have a consistent length. For long running series, there is usually a minimum of 4, 000... more>> words per chapter. From what I read, the novel moves from very short to very long. This suggests that the author hasn't thought of how he/she will write each chapter, making the story become a mishmash of very short to long chapters. So far the story seem like a typical "underdog turned champion". The main character (of the novel), has interesting character and somewhat "tragic" back story but there's not much else about it, it might ot might not change in the future but for now, it has a lot of potential. Like many have said it suffer a lot from the constant POV change at the worse possible moment, completely breaking the flow of the novel. Usually I don't review novels, maybe leave a score and that's it.. But, this. This deserves my hate for multitude of reasons. We can ignore the fact that translation and editing is crap. That's the least of the problem. The story is about some person without a personality "reincarnating" for no reason into an anime character that is loved by weirdos and hated in the story. Because the person is a fan and watched the anime, he decided to "help" change the events and become a protagonist. (with... more>> his knowledge of the basic plot) So now we have a MC who acts like an exact copy of the anime character, except with few bonuses of knowing the past. Trying to not have the bad ending. My problem is that the MC becomes a literal copy. No unique personality of his own, he just becomes the actual pig. Which makes no goddamn sense. The author could have gone with the route of the pig returned back in time with his memories and tried to change and it would still be the f**king same. And it's annoying being reminded of the fact that MC is the one who watched anime. Is GARBAGE. He only watched the anime and knows all the tiniest details of the plot. I get the fact the authors needs exposition and cheats, but, come on. Nobody here is retarded. We all know no anime will give such huge details across the span of what... 20something years of the pigs life, including side characters and that. No anime gets that kind of treatment, not even in fantasy. Short and spread wildly around. One chapter may be going in a direction, and you expect to continue it in the next chapter, yet what you get is something else. And it keeps going on. It is an absolute mess. And as for the chapter length, most of them are minuscule in size. You finish reading it in one swipe. Bland, faceless, and predictable. The annoying part is how they behave when next to another character. piggy duke did this, piggy duke did that, piggy duke was. The amount of time the author repeats piggy duke is really cringeworthy. Don't bother reading this the main character doesn't have self-respect to the point he calls himself a pig and starts to make funny pig noises every time its frustrating. My review for this is -1 as the only thing it did was manage to piss me off. ... it's hard to like this series. No, I'm not talking about the translation; I'm talking about the story in general. Every protagonist should have a proper trait that follows a certain principle, and it needs to be consistent unless there's a major scene where they need to change and adapt. But for this MC, it feels as if he's... unstable, mentally. How should I put it... there were so many inconsistencies in his actions I don't even know what kind of person he is. In one part, he was a self-depreciating person,... more>> then changed into a confident one, suddenly turned into a schemer as if he knew everything, suddenly turned amicable and wise, then back to being useless. Now, all of those seems pretty normal and humane. But the problem is author failed to delivered them correctly. The transition between personas seemed forced and absurd as if those personas can be turned on and off with a switch. Human can't do such thing, you know. Instead of depicting him as human, instead it turns him into a mentally unstable person, and that's bad especially when author wanted to pictures him as a MC. The story itself, while an interesting cliche, is executed so poorly and randomly that it leaves you wondering why something was done. Honestly, half of the actions that the MC takes just leave me scratching my head and trying to figure out if there was supposed to be some deeper meaning. I am enjoying this novel but not to the point of jumping head first to read it the second an update appear. This novel to be fair is a mess to read. Event happen randomly, character talk and behave sometime required multiple read to understand what the hell is going on and some "chapter" are so short that it take 5m to read through and that is me reading every single bloody word to understand what the hell is going on. 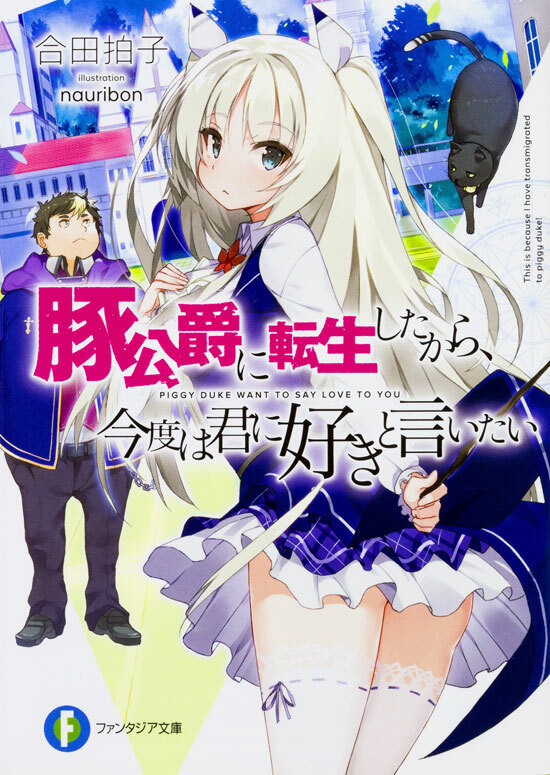 This is a slice of life "isekai" novel about a... more>> guy doing exercise to confess to his childhood maid. The Isekai is only used as plot device for info dump on new character. Trope get repeat too much it get annoyed to read for example naming a few: "buhihihi" pig-like laugh, white piggy duke, I am a piggy duke, etc. Some chapter if you cut out the piggy duke joke, the chapter length drop by 1/4 to 1/5 and in a already short chapter like this novel, it is a lot. This novel in few words: Redemption of the Piggy Duke. The most hated by his peers, and the most loved character by the audience. A random Japanese guy fuses with our Piggy Duke, now with the knowledge of the future (from the anime) and the manoeuvers behind curtains (from the Piggy Duke) the ultimate protagonist is born: The White Piggy Duke.